It was our last weekend before the holiday break was officially over. We've been waiting for a bit of decent weather without too much wind to head out again, and on Saturday it was good enough. I was at the tiller for a lot of the time, practicing my steering skills. Yes, I'm definitely getting the hang of this. When we were out of the channel we sailed using the headsail. It was peaceful and quiet, sailing at about a steady 7 knots. 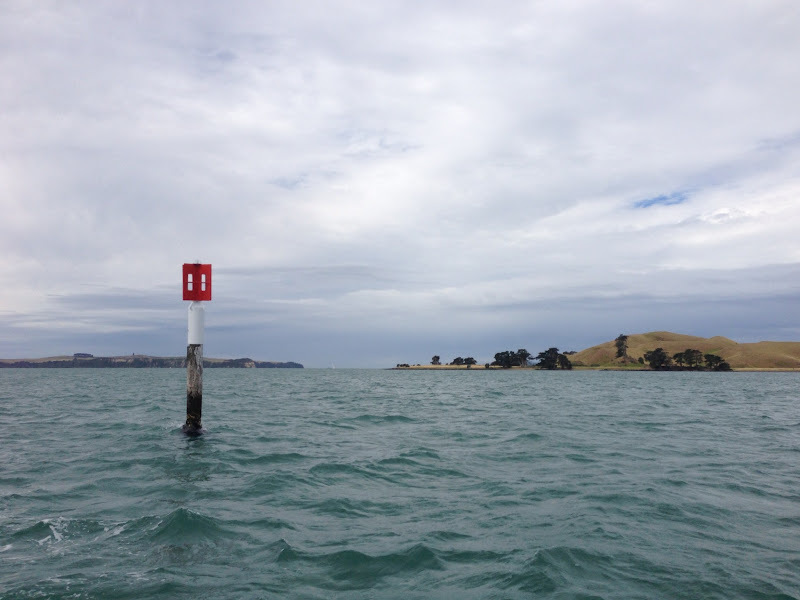 We made our way to Owhanake Bay at Waiheke Island. We anchored up and Jef was able to relax. As the skipper, Jef feels the weight of responsibility rest solely on his shoulders. 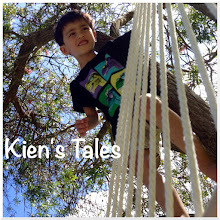 Kien is really good on board. He knows that if we start moving the boat he either has to have his lifejacket on or stay inside. He has always chosen to stay in the cabin, and when we have anchored up he comes out to play. I am so glad he loves it as much as Jef and I do. Jef decided to pump up the dingy and go for a paddle around the bay. I love seeing international vessels in our waters. I wonder where these people have come from, how far they have travelled, what adventures they have had? We sat on deck and watched as the light slowly faded from the sky. It was our first night on our boat. Looking out to Motutapu Island. In the morning Jef cooked a yummy breakfast - cheese Krasky. 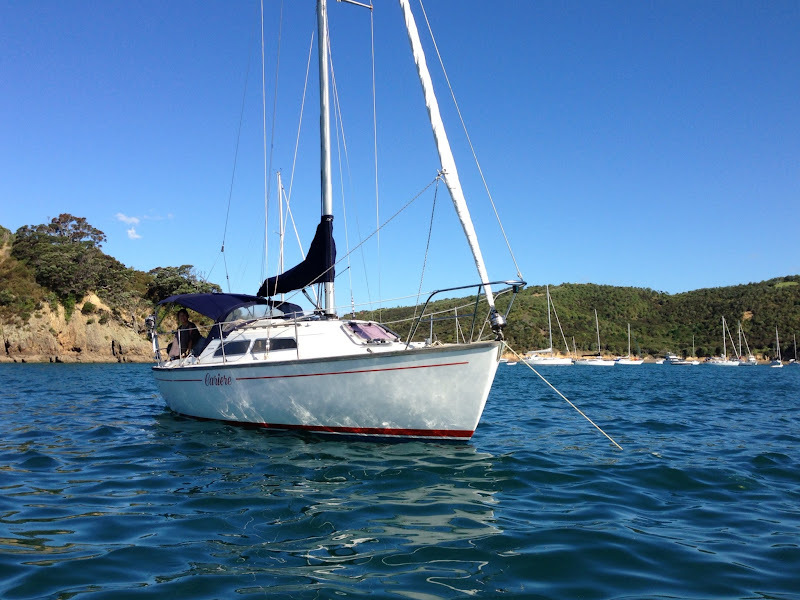 Of course I had to go for a swim, I mean, come on - we are anchored in a beautiful bay, nice deep water all around, the sun is smiling in sky, so what's a girl to do? After I got out and showered we boiled some water and checked Kien into the tub. Boy he loved it! 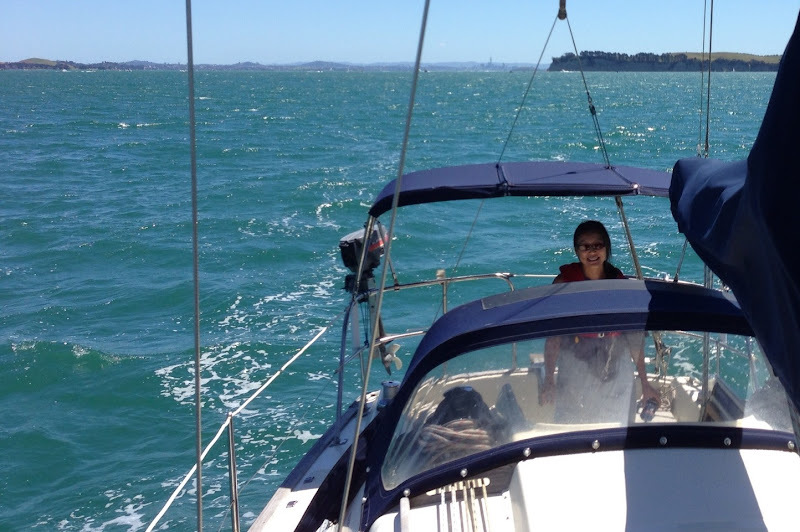 It was mid afternoon by the time we pulled the anchor up and headed back to Half Moon Bay. The wind had picked up substantially, and since I am a complete novice sailor there was no way we were going to risk it and sail back. So we motored in, past Browns Island, through the channel and back to the marina. Jef's going to have to do a little bit of work on the engine. It was pumping some brown smoke out the back, and when we got back into our berth and lifted out the stairs to check the engine it was covered in soot. Luckily my man is handy, and positive, and hopefully he will have this sorted fairly quickly. I'm looking forward to our next away trip, although we are not sure when this will eventuate. I'm hoping soon!